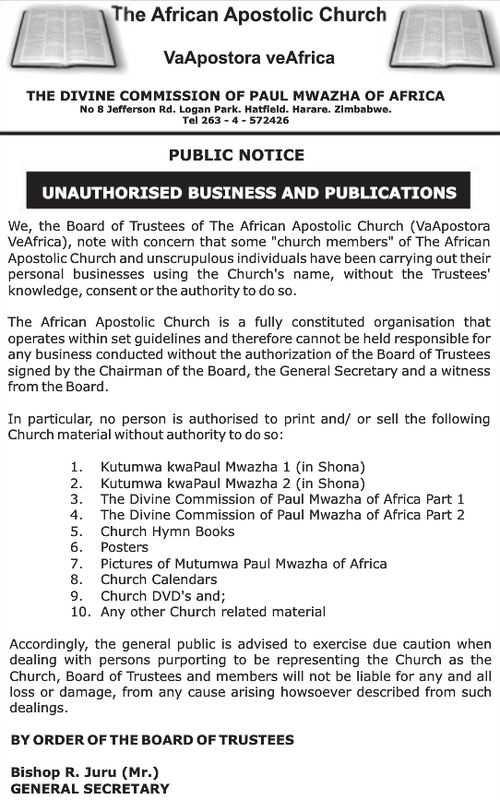 The Board of Trustees of The African Apostolic Church (VaApostora VeAfrica) said it note with concern that some "church members" of The African Apostolic Church and unscrupulous individuals have been carrying out their personal businesses using the Church's name, without the Trustees' knowledge, consent or the authority to do so. The African Apostolic Church indicated that it is a fully constituted organisation that operates within set guidelines and therefore cannot be held responsible for any business conducted without the authorization of the Board of Trustees signed by the Chairman of the Board, the General Secretary and a witness from the Board. The general public is advised to exercise due caution when dealing with persons purporting to be representing the Church as the Church, Board of Trustees and members will not be liable for any and all loss or damage, from any cause arising howsoever described from such dealings.